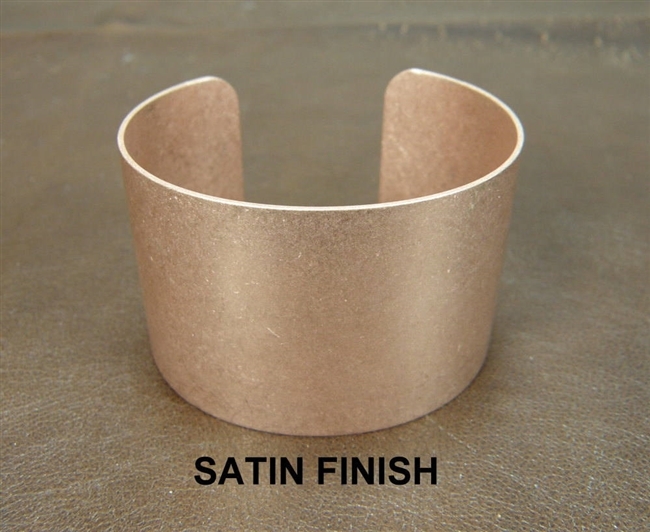 These cuff bracelet blanks are made from top quality 20 gauge (.032") solid copper. Each blank measures 1 1/2" wide and 6" long. (1 .5" x 6") These are tumbled to a beautiful silky satin finish. They are ready to wear or decorate. Sold Per each. These copper blanks are wonderful for decoupage, wrapping with fibers, ribbons, leathers or fabrics, Patina them, use them for polymer clay work, wire wrapping, as a base for bead embroidery, flame paint, corsage bases.....the possibilities are endless! Round and preformed: corners are rounded and the blank is preformed to the bracelet shape. Square and preformed: corners are left square and the blank is preformed to the bracelet shape. These are not available to be shipped flat, only preformed to the bracelet shape. Our bracelet blanks are made right here in the USA, in our Veteran owned and Family operated shop. Need a custom size? No problem! Just email us or call, custom orders welcome.